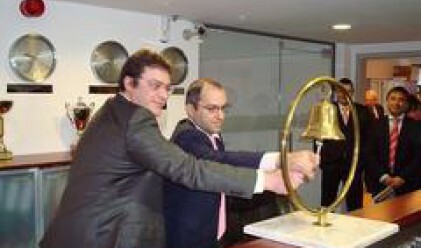 The stock exchange debut is part of Enemona's strategy for development through 2012, said Prokopi Prokopiev, the company's Corporate Strategy Director. Enemona plans to consolidate its energy projects in one company, which is to be listed on the Bulgarian Stock Exchange at the end of 2009. The three public enterprises in the group are currently Lomsko Pivo, FEEI REIT and FINI REIT. Enemona Jsc is also planning to file a capital increase by 2009-2010, Mr. Prokopiev also said. Its strategy also stipulates expansion to EU markets (England, Germany and Belgium) as well as to Russia and some African countries. The energy program of the Russian Federation includes realization of 100 bln dollars of investments. Enemona's representation in the country is actively participating in the implementation of these large projects, and has been assigned two contracts so far. The company is also working on the modernization of a power plant in the Republic of Togo. Enemona Jsc expects 2008 sales revenues to reach 112.819 mln leva (57.683 mln euros), and to grow to 171.876 mln (87.878 mln euros) by 2009, and to 224.702 mln leva (114.888 mln euros) by 2010. Net profit for the following three years is estimated as follows: 17.765 mln leva (9.083 mln euros), 21.978 mln leva (11.237 mln euros), and 24.022 mln leva (12.282 mln euros). With the recent opening of four new shops, CBA Asset Management now controls 15, CEO Ivaylo Marinov said today. “When we first made plans for BSE listing we had 9 shops. We are currently following a 5-year development plan, which includes expansion to other cities on Bulgaria. We are to announce more details in the following weeks,” he also said. CBA Asset Management will use the IPO proceeds to finance the establishment of new shops and renting of existing ones. The company plans to invest in expansion of the logistics center in Ruse, and in the construction of such in Veliko Tarnovo. CBA will introduce am ERP system and will develop its loyal clients program.